The Daily Telegraph reported last month on the views of David Pitt-Watson, that excess charges can eat up 50% of pensions in the UK. This is higher even than the estimates I saw when collating the overall figures of around £11 billion annual costs of consumer detriment in financial services. Even at times when stockmarkets were growing rapidly, it could take a decade for regular contributions to insurance based investments, such as endowment personal pensions, to break even. Inefficiencies in the distribution chain mean that UK retail investors can pay far higher charges than US investors – an exercise in sheer value destruction – in this case by the variety of intermediaries and ‘experts’ that stand between consumers and markets. In the USA, the Dodd-Frank Wall Street Reform and Consumer Protection Act signed by President Obama runs to over 830 pages. In the UK, we don’t yet have concrete proposals, but we do have some good ideas. The Future of Finance from the LSE is an excellent collection of papers from a number of leading commentators – including Martin Wolf (FT), John Kay and Andrew Haldane, of the Bank of England. We are all on the lookout for signs of environmental sanity breaking out. This, I thought, was a hopeful one: a July 2010 study Solar and Nuclear Costs – the Historic Crossover by establishment economist John O. Blackburn, which finds that solar energy is now cheaper than nuclear. A scoreboard put together by Ethical Markets puts the tally of private sector investment worldwide in greening the economy at £1.64 trillion since 2007. Today is national complaints day – a great initiative and, intriguingly, set for a Friday 13th. We complain more as a nation as we ditch the culture of keeping a ‘stiff upper lip’ – and probably for good reason. Despite all the money and time spent on ‘customer service’, most businesses haven’t really changed the relationship they have with customers. My very favourite book on customer service is Mark Bradley’s little classic “Inconvenience Stores” where he charts his experience as a consumer over twelve months. For anyone in the service sector, it is a perfect reminder of why we complain. I visited the New Economics Foundation today – lovely to go back. 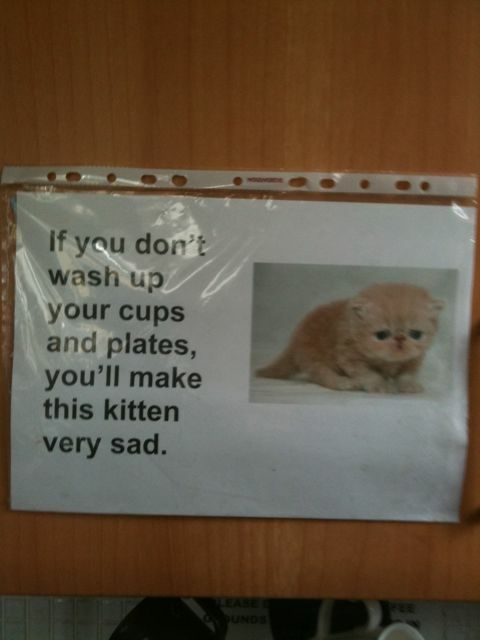 There’s a new notice in the kitchen though, all part no doubt of their work on well-being (for cats). It is a time for thinking big about co-operatives, and while the ideas tend to be running ahead of practicalities, it is great to see David Miliband raise the stakes, by asking if the BBC could be turned into a co-operative in future. If I remember it right, some work and thinking on this was done in the heady, early days of life at the thinktank Demos – but then went nowhere. What membership could give the BBC is more robust independence from pressure and bullying – whether from the UK Government or on sensitive issues of editorial policy such as Middle East politics. This would have somehow to be optional membership rather than a compulsory add-on to the license fee – needs work and thinking but it is well worth developing as an option for the future. 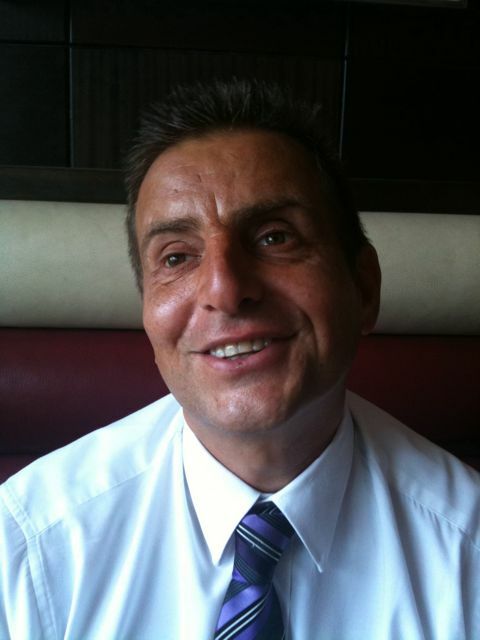 Met up with the wonderful Steve Cunningham to compare notes on inclusion and disability. A keen co-op fan, Steve is the world record holder for both land and air speed records for a blind person. His work with the charity Blindvision promotes change in business by changing mindsets.